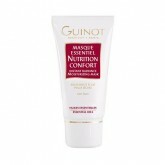 Guinot was founded by pioneering French biochemist René Guinot in the 1960s, who realised that extracts of plants and fruit could slow down the skin’s ageing process, especially if they could penetrate deep into the skin. Today Guinot still takes a scientific approach to beauty, working closely with leading university facilities and hospital research centres to create an innovative, cosmeceutical skincare and treatment range. 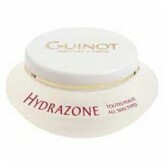 Guinots Hydrazone Toutes Peaux provides a continuous source of moisture for the three main areas of the face due to the hydro-liposome’s lastingly binds moisture into the skin. Ensures deep and lasting moisture, leaves skin sort and supple, brightens the complexion. Drenches the skin in an instant bath of nutrition, with essential oils. The energy of essential oils boosts radiance. Natural oils nourish the epidermis. Immediately restoring radiance and comfort.